You know Dasher and Dancer and Prancer and Vixson, Gulfstream and Piper and Beechcraft and Cessna; but do you recall the least-known aircraft of all? OK, so I’m not a poet or songwriter. Have you ever heard of an aircraft manufacturer called EMBRAER? Do you recognize their logotype? Well, I’ll bet you have flown on one of their aircraft. Embraer S.A. is a Brazilian aerospace conglomerate that produces commercial, military, executive and agricultural aircraft. The company also provides corporate and private aeronautical services. It is headquartered in ão José dos Campos in the State of São Paulo. On August 19, 1969, Embraer; (Empresa Brasileira de Aeronáutica S.A.) was created. With the support of the Brazilian government, the Company turned science and technology into engineering and industrial capacity. The Brazilian government was seeking a domestic aircraft manufacture thus making several investment attempts during the 1940s and ’50s to fulfill this need. Its first president, Ozires Silva, was appointed by the Brazilian government to run the company. 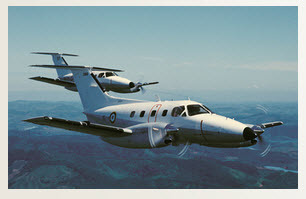 EMBRAER initially produced one turboprop passenger aircraft, the Embraer EMB 110 Bandeirante, a project organized and executed by Ozires Silva. 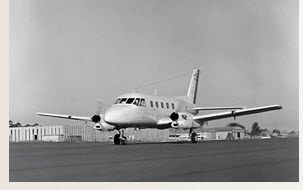 The first EMB 110 Bandeirante to be produced in series made its maiden flight on August 9, 1972. On the 19th of that same month, a public ceremony was held at the Embraer headquarters, attended by officials, employees and journalists from not only Brazil but several countries in South America. That aircraft is shown by the digital below. Another workhorse is the EMBRAER 195. That aircraft may be seen below. It costs approximately $40 Million, which is just as expensive as the average narrow-body passenger jet and seats 108 passengers in a typical layout, 8 more than the average narrow-body passenger plane. The maximum seating capacity is 122 passengers in an all-economy class configuration. The 195 uses roughly $11.64 worth of fuel per nautical mile flown (assuming $6 per gallon of jet fuel). On a per-seat basis, this translates to being 7.3% more cost-efficient than the average aircraft. A maximum range of 2,200 nautical miles (equal to 2,530 miles) makes this aircraft most appropriate for long domestic flights, or very short international flights. With a service ceiling (max cruise altitude) of 41,000 feet, it is just slightly higher than the norm for this type of aircraft and can certainly get above most weather patterns along the flight route. The Embraer EMB-505 Phenom 300 is a light jet aircraft developed by Embraer which can carry eight (8) or nine (9) occupants. It has a flying range of 1,971 nmi (3,650 km) and carries a price estimate between US $ 5 million and US $ 8 million in 2012. At 45,000 feet (14,000 m), the Phenom 300 is pressurized to a cabin altitude of 6,600 feet (2,000 m). The jet features single-point refueling and an externally serviced private rear lavatory, refreshment center and baggage area. It received FAA Type Certification on 14 December 2009 as the Embraer EMB-505. On 29 December 2009 Embraer delivered the first Phenom 300 to Executive Flight Services at the company’s headquarters at São José dos Campos, Brazil. In just four years, the Phenom 300 climbed to the top position on the list of most delivered business jets, with 60 units delivered in 2013. The Phenom 300 is the fastest seller in NetJets‘ inventory, counting thirty-six (36). A beautiful aircraft with the ten (10) most recent deliveries totaling $90 million. 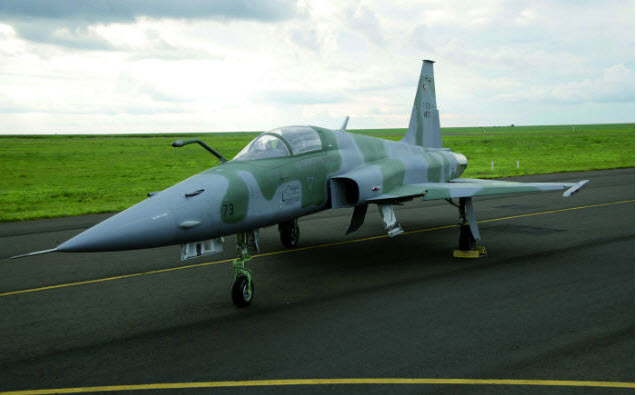 Embraer has started work on modernizing a second production of Northrop F-5E fighters and F-model trainers for the Brazilian air force. Three aircraft from a total of 11 are already being worked on at the company’s facilities in Gavião Peixoto, Brazil, with deliveries expected to start later this year. Embraer says it completed the delivery of a first batch of 46 modified F-5EM/FMs in 2012. That aircraft is shown below. The AMX and F-5 fleets are also receiving Elbit Systems-built radars, in addition to upgraded electronic warfare equipment, in-flight refueling systems and other improvements. Meanwhile, the Brazilian navy is also upgrading its small fleet of 12 Douglas A-4 Skyhawk carrier-based light strike aircraft. At least one of the Skyhawks is currently being modernized at Gavião Peixoto, but Embraer could not immediately offer any details. Alongside the modernization work for the Brazilian military, the factory at Gavião Peixoto is at work building a number of Super Tucanos for export customers in Angola and Indonesia. Brazil is has previously increased spending on defense to prepare hosting the FIFA World Cup in 2014 and Olympic Games 2016 respectively. There is also a growing realization in the country that it will have to work diligently in the future to protect its vast natural resources. This could unfortunately require military preparedness. 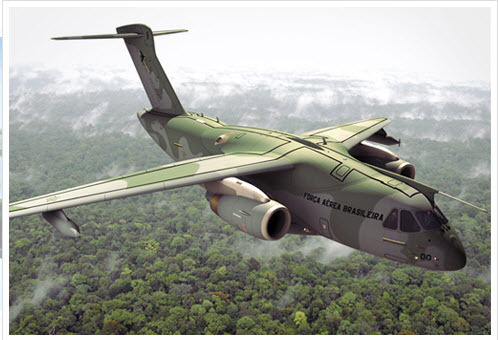 The Embraer KC-390 is a medium-size, twin-engine jet-powered military transport aircraft now under development. It is able to perform aerial refueling and to transport cargo and troops and will be the heaviest aircraft the company has in its inventory. 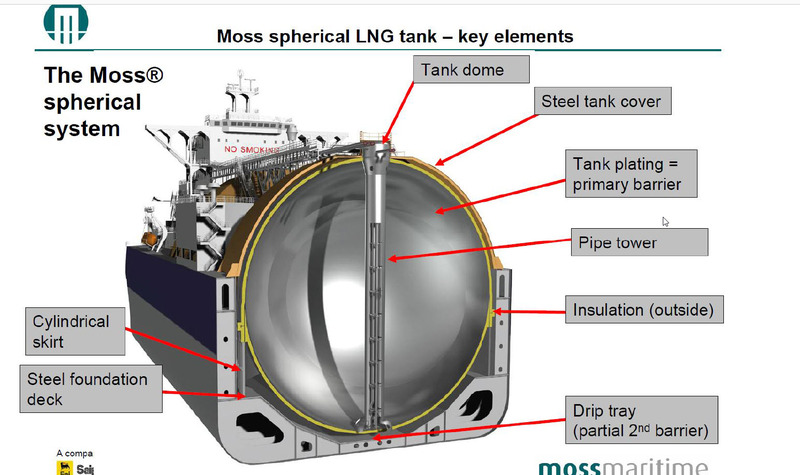 It will be able to transport up to 21 metric tons (23 short tons) of cargo, including wheeled armored fighting vehicles. The Ipanema is the market leader, with 50 years of continuous production and over 1,300 units sold, representing about 75% of the nation’s fleet in this segment. 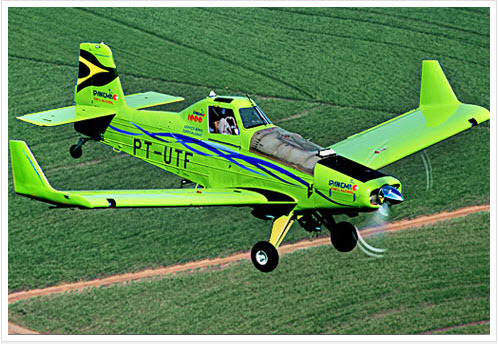 The Ipanema agricultural aircraft is a leading agricultural market in Brazil, with about 60% share. There has been 40 years of continuous production and constant research to improve the aircraft. That concentration of effort always focused on the needs of the customers and the national agricultural market. This brand demonstrates the reliability, solidity and tradition of Ipanema. One other fact, the Ipanema is the first aircraft certified to fly powered solely by ethanol. In addition to the economic advantages and obtained improvement in engine performance, ethanol is a renewable source of energy, which helps protect the environment. As you can see, the United States aircraft manufacturers do have competition and excellent competition at that. This foreign entry keeps us on our toes. If we just went by the numbers, we would have to say gold is the most valuable with second place going to Platinum. One is used for decorative purposes and one used in producing electronic components and other hi-tech assemblies. I have another candidate. A commodity that will become increasingly important as the years and decades go by. I submit to you that in the near future, wars will be fought to secure water rights and access to water itself. Please take a look at the map below. 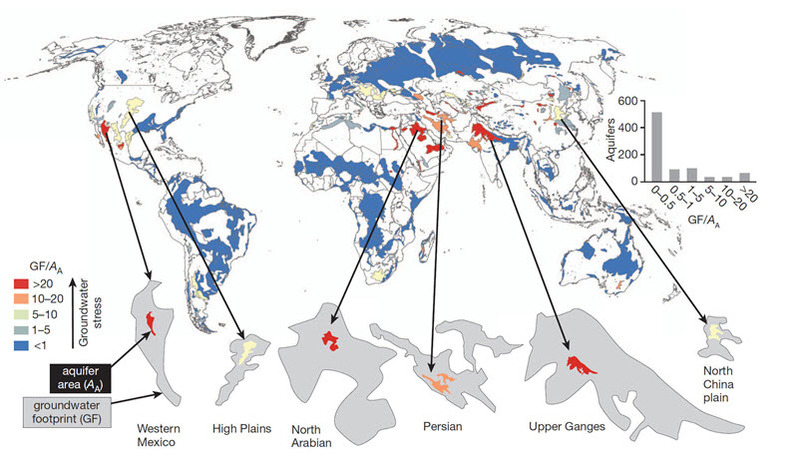 The aquifers that are painted red, orange, or yellow, meanwhile, are being drained rapidly. How rapidly? That brings us to the complicated part of this graphic. See those large grey shapes, below the map? Each one is a magnified reflection of an over-exploited aquifer. The amount of magnification represents the amount of water that people are currently pumping out of that aquifer, compared to the rate of natural replenishment. Tom Gleeson, at Montreal’s McGill University, and Ludovicus P. H. van Beek, at Utrecht University, in the Netherlands, created this graphic for an article they published in this week’s issue of the journal Nature. They call those magnified shapes the “groundwater footprint” of each aquifer’s exploitation. The footprint of the Upper Ganges aquifer, for instance, is 54 times bigger than the aquifer itself. Think about that footprint this way: It’s the size, on a map, of the area that would be required to catch enough rainfall to replenish that aquifer and make up for all the water currently being pumped out of it. Some of these aquifers are being exploited at a stunning rate, but what’s truly alarming is how many people depend on that over-exploitation for their food. These aquifers include the Upper Ganges, covering densely populated areas of northern India and Pakistan, and the North China plain, which is the heart of corn-growing in that country. The aquifer of Western Mexico has become a large source of fruit and vegetable production for the U.S. The High Plains aquifer in the United States, meanwhile, is having a particularly bad year. Farmers are pumping even more than usual, because of the drought afflicting this part of the country, and it is getting less replenishment from rainfall. So water levels in the aquifer are falling even faster, leaving less water for the region’s rivers, birds, and fish. This can’t go on forever. Already, many farmers are being forced to dig deeper wells to get at that water. But bigger changes are on the way: New irrigation technologies that use water much more efficiently; a shift to different crops that demand less water; and in some areas, they’ll just have to stop using those underground stores of water altogether. This year, 2012, cattlemen are selling their stock due to the remarkably high price of grain and other feed stocks. In some parts of our country water rationing occurs due to significant drops in lake and river water levels. Record wild fires are occurring in the western parts of our country due to lessening of annual rainfall during the “rainy season”. We could spend a lifetime trying to determine the actual root cause but in the meantime, we have to deal with reality. Reality says; let’s investigate technologies that can provide needed water quantities to suppliant what we have already. Some years ago I had an opportunity to visit Dubai, UAE. Fabulous visit and very insightful in several areas one being; most of their potable water is derived from desalination plants situated in the Persian Gulf. The water is then treated and piped to the city itself. I feel that our country needs to start planning right now for an event that is probable, possibly within my lifetime—a severe water shortage. Your comments are welcomed.